With Nintendo’s recent announcement that they will start venturing into mobile development, there is endless speculation as to what kinds of games they might develop in the future and how they will use (or possibly abuse) the free-to-play models that the devices are known for. 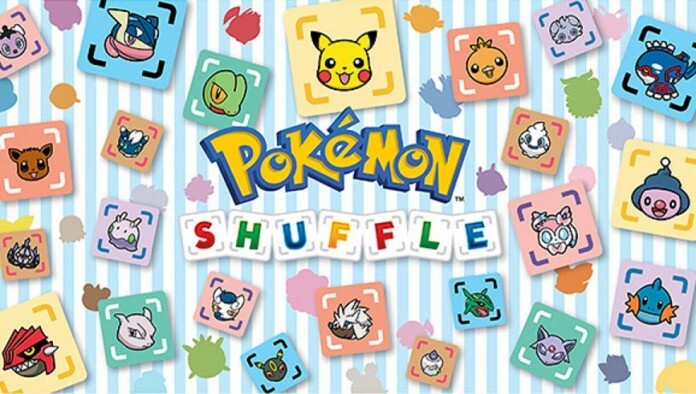 Fortunately, we already have a glimpse of how Nintendo may tackle the mobile market with Pokemon Shuffle, a free-to-play 3DS game that can best be summarized as “Candy Crush with Pokemon“. That’s not to say that the game doesn’t have a few of its own twists on the formula; it’s just abundantly clear where the business model for this title was taken from. Pokemon Shuffle is a your typical match-three puzzle game with a few unique mechanics. For one, you’re matching your own team of four Pokemon that you select from your collection at the start of each stage. Each Pokemon has a type, attack value, and special effect that can trigger when they’re matched. Using Pokemon will earn them experience and level them up, gaining more attack power. Pokemon won’t evolve over time and their evolutionary forms have to be caught seperately, but certain Pokemon can Mega Evolve during a stage if you have its Mega Stone and place it at the front of your team. To start a Mega Evolution, you’ll need to fill the Mega Gauge at the side of the screen by making matches of that Pokemon. Mega Evolution lasts for the remainder of the stage and gives that Pokemon more power and a more valuable effect. The new and old ideas meld together well and make this a distinctly Pokemon-styled puzzler. Now the question is how you actually add Pokemon to your collection. Each stage in the game is represented as a battle with either a wild Pokemon or a rival trainer. Defeating a wild Pokemon will give you a chance to capture it while trainers will challenge you with a mega evolution and reward you with the corresponding Mega Stone upon victory. Building an optimal team for each stage requires strategy as certain Pokemon will be significantly more useful on certain stages. There is a option to have a team automatically optimized for you, but this will only account for type advantages and attack power with no regard for effects. The most skilled players will be able to balance out the values of various effects to truly optimize their teams on their own. Effects do have a great deal of significance as enemy Pokemon won’t just stand around while you line up combos. Some will occasionally disrupt your board by freezing your some of Pokemon or replacing them with stone blocks or weaker Pokemon. Others will only allow you a scarce few turns before they flee, forcing you to chain strong combos immediately. Many stages are genuinely difficult and will demand an optimized team to get through. The one major issue is that there isn’t any kind of preview for the stage that you can build a strategy off of, so tactics for harder stages will have to be built through trial and error. Also, the cascade effect is still a big factor and massive combos will result more often from luck than from tactics and the biggest chains won’t really feel earned. Story is nonexistent as the game focuses simply on the “gotta catch ’em all” motto of the franchise. Even the rival trainers you meet are represented as black silhouettes of characters from the main line of games. It’s a bizarre decision that only reduces the game’s personality as opposed to what it might of had if it they’d just directly ported art assets. There’s also little sense of exploration as the campaign follows a strictly linear path from start to end save for the unlockable expert stages. The only facets of personality that the game has come from the adorably minimalistic artstyle and the somewhat bland musical score. The intended tone is best set by the Mega Evolution theme, which is less like an elevating point for an intense battle and more akin to the goofiest carnival music you’ve ever heard. Pokemon Shuffle is structured like a casino machine and it’s not ashamed to embrace that with its aesthetics. The most vital factor to consider a free-to-play game is the business model and, fortunately, Pokemon Shuffle handles it quite well. Spending real money will get you virtual jewels, which can then be exchanged for hearts or coins or can be used to keep going on a stage that you’re about to fail. Hearts are needed to play stages while coins can be exchanged for consumable power-ups or Great Balls that are twice as effective at catching wild Pokemon as the default Pokeballs that you have an unlimited supply of. Both hearts and coins can be acquired without having to spend jewels as a heart will automatically be given to you every thirty minutes if you have any less than five. Coins are even easier to get as you’ll receive some every time you win a stage and when you check in online daily. Even jewels can be acquired without spending anything as they’ll be awarded the first time you defeat a trainer and during special events. These are rare, but it’s the sentiment of generosity that helps make the game more enjoyable. There are also regular free content updates and daily challenges that provide plenty of replayability. You’re bound to feel the paywall hit whenever you run out of hearts, but Pokemon Shuffle is as generous as it can be while still expecting to make a profit. Given that cosmetic items like those seen in League of Legends and Team Fortress 2 can’t work in a game like this, the business model couldn’t be much kinder to consumers outside of just making the game outright free. Pokemon Shuffle works best as a bonus game for the 3DS that players can turn to in-between rounds of full games and makes for good bit of variety. It’s certainly worth downloading; just don’t let it nickel-and-dime you too much.